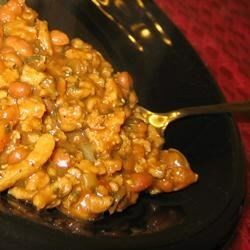 "This is a barbecued bean recipe I came up with on a whim thinking it would taste good. As it turns out, it tasted great!! My boyfriend ate more beans than BBQ!" Cook and stir the ground beef in a large skillet over medium-high heat until evenly browned; drain. Combine the onion and garlic in the skillet with the beef, and cook until the onion becomes transparent, 3 to 4 minutes. Stir the salt , pepper, garlic powder, onion powder, and parsley into the beef mixture; cook 1 to 2 minutes. Stir the canned beans into the beef mixture. Add the mustard, brown sugar, Worcestershire sauce, and barbecue sauce and stir until blended. Taste and season with additional salt and pepper, if desired. Lower heat to medium-low and simmer mixture for 30 minutes to thoroughly combine flavors. This was a big hit with the whole family. I followed the recipe as it was - except... I used Sweet Baby Ray's BBQ Sauce & only about 3/4 Cup, instead of 1 1/2 Cups. Excellent! great recipe, doubled up the recipe and made this dish on memorial day Bbq. No leftovers!!!! Everyone loved em!!!! thanks for the recipe. Awesome, made it for a guys graduation party, it was a hit! I made up this recipe just this morning for an afternoon bbq. Easy and SO SO delicious! Thanks, Yoyo!